The world around us is filled with opportunities to make photographic images. Often, we see a photograph, yet the end result does not reflect our vision. It’s easy to get caught-up in the moment, and forget to “see” what is actually in the picture. The “cool” subject gets lost in the photography, and it becomes a collection of “things” that distract from our original vision. There are several ways to “clarify” what a photograph is about. In the picture below, the mushroom stands out against the oak leaves. This photograph was taken under a large oak tree in the middle of an urban area. I wanted to photograph the colorful mushroom, and have it stand-out as the subject. 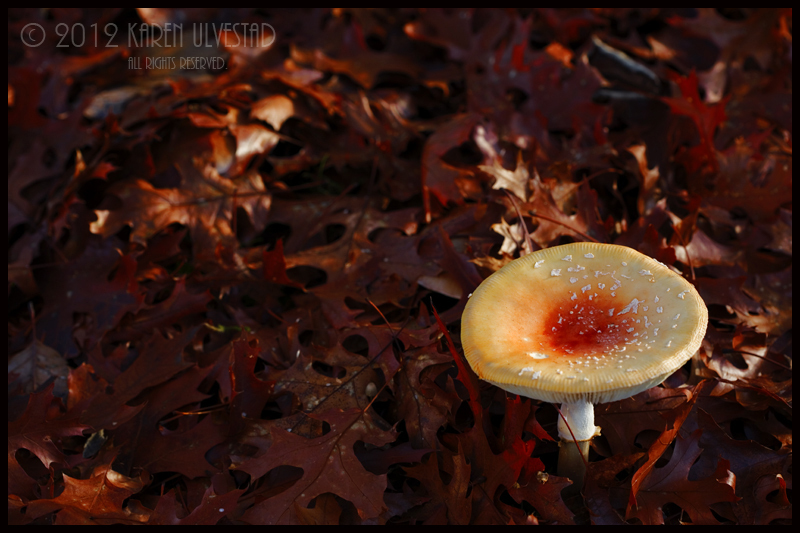 I used the similar colored leaves as the background, chose a depth of field to indicate they were leaves, and the mushroom is completely sharp. It is best to use a tripod for this type of photo. The second part of this image is the use of color. The leaves reflect the color in the center of the mushroom. The yellow and white of the mushroom stand-out against the reddish colored leaves. I did reflect light into the scene with a gold reflector. 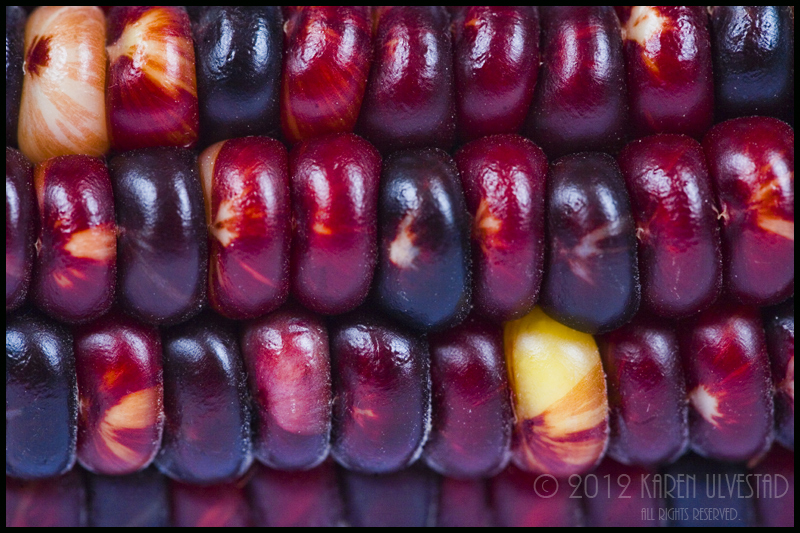 This next image is of a cob of corn. This is a macro shot taken in my studio. I used studio lighting, a tripod and my 100mm macro lens. In the camera, I cropped the photo to include this portion of the cob. I liked the variety of colors and designs. Each is similar, yet unique. I used the repetition of shape to create a pattern, and it could be viewed as an abstract photograph. This third example was taken in the kitchen on a cutting board. I used one studio light, kitchen lighting and ambient light. 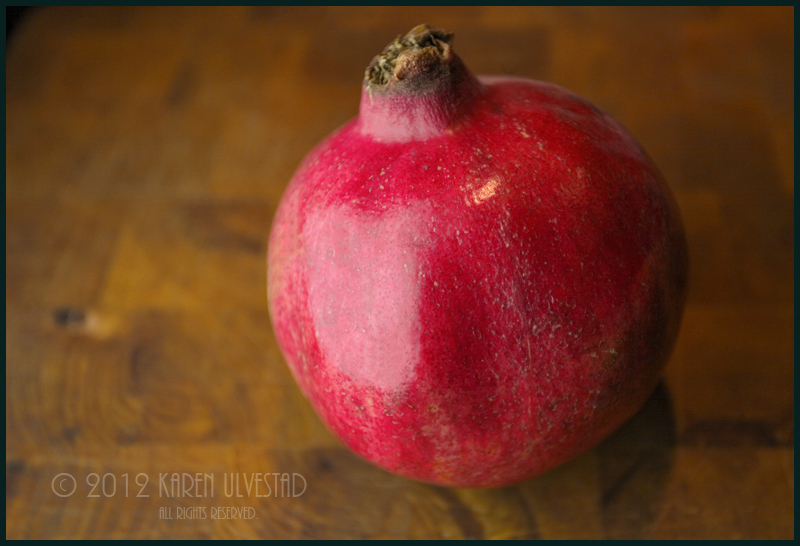 My focus was on the color of the fruit, and this was the focus of the studio lighting. The cutting board turned a warm color with the lighting. This was taken with a shallow depth of field, so the board would become a soft background. It’s important to crop in the camera, to retain the file size and information for the photo. Each of these photos uses color and cropping to give importance to the subject. Great article! Well written and a wonderful focus reminder. Macro is my first love and I particularly love your “leaves and mushroom. Well done and inspiring to make you want to go out right now and shoot!